I know I say it a lot, but the Yoga Tune Up® Level 1 changed my teaching. I think it’s important to add that I was ready for my teaching to change. It was 2013, and I had been teaching classes for 6 years and leading 200hr Teacher Trainings for 3. I was in some pain here and there – mostly my SI joints and neck. I was a little bored, too. The asanas weren’t exactly cutting it for me physically or creatively. It’s extremely difficult for me to teach subject matter that I don’t totally believe in. Students can smell lack of enthusiasm from a mile away. One day at the old YogaWorks Union Square studio, I saw a poster for the YTU L1. I was particularly drawn to the therapy ball component of this training. I had been using tennis balls to help myself temporarily relieve intermittent neck pain. Like my SI joint pain, this neck discomfort reared its ugly head for days at a time every month or two. It left me feeling really uncomfortable and confused. How was I teaching ‘a healing art’ but also in regular pain? I felt like a failure and a fraud. It was this mindset, more than anything, that propelled me to undergo the incredibly intense and transformative process of the Yoga Tune Up® Level 1 training. I’m a worker bee. (Bee is for Beversdorf.) The training’s intensity played well to my personality. Surprising to me, though, was how impactful the process was on my practice. It reinforced for me that in order for me to change my teaching, my practice needs to change first. The seven day process gave me the building blocks to reshape my practice, which naturally reshaped my offerings and message as a teacher. The biggest shift was away from prescriptive teaching (a do-as-I-say-to-make-this-shape-approach) toward teaching movement to facilitate student’s self-directed experiences. I learned to better lead the process of inquiry. I didn’t learn to teach Yoga Tune Up® classes, per se. Rather, I gained YTU teaching tools to align my classes more closely with my values and goals as an educator. The exposure to dozens of corrective exercises, self-massage techniques and habits of thought, guided this shift in my attitude toward teaching. This didn’t happen overnight. My teaching has been changing steadily since (and largely because of) the Level 1 training. It planted many seeds that sprouted fruit days, months and years down the road. It gave me a taste of who I wanted to be and how I wanted to show up as a movement educator. Most surprising to me, however, was how the Level 1 helped me tap into myself emotionally. My mom had died of cancer a little over a year prior. The self-massage sequences and investigative movement were potent tools for connecting to and touching my pain in what felt like safe and nurturing ways. I realized how angry and sad I was still from the trauma surrounding the loss of my mother. I sought therapy soon after the training and began the process of working through my pain in earnest. Moving my body in novel ways moved me to feel new possibilities and change my perspective on my own ability to change and to heal. 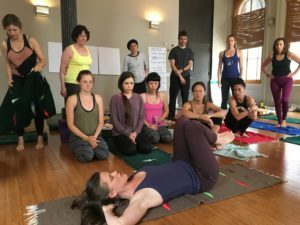 Probably most transformative, this training connected me with a very positive drive to educate and empower my students toward a greater curiosity and trust for their body’s ability to heal. It didn’t give me special poses with curative properties, or endow me with a instantaneous medical degree. Rather, it showed me that I could follow my own intuition more as a mover and inspire my students with the tools I had as a teacher to do the same. One big lesson I learned is that as students, maybe we don’t need to be told what to do so much as we need to be given permission to feel. The Yoga Tune Up® Level 1 training, and the mark it made on my teaching, was my permission slip to play. It was my ticket to parts of myself through new avenues of movement. I immediately felt the benefits of a more multi-disciplinary approach to practice. This new experience beget more new experiences. Soon after the training, I dove into weight-lifting, Yoga with Resistance Bands, Feldenkrais and kettlebells. My students reaped the benefits because my practice naturally translated to a revival of my class plans and offerings.With enthusiasm, I shared all the new tricks up my sleeves. With more care and sensitivity, I helped my students find new paths of feeling through their bodies. I’m so grateful for the work of Jill Miller and the vivacious, supportive community that is Yoga Tune Up® for launching me whole heartedly in this direction. If you are curious to learn more about Yoga Tune Up® or its sister brand Roll Model Method please check my events page for upcoming trainings. You can also attend my regular weekly Yoga Tune Up® Self Care classes. Contact me to find out when my next training is scheduled, or if you’d like to book a training at your studio or gym.